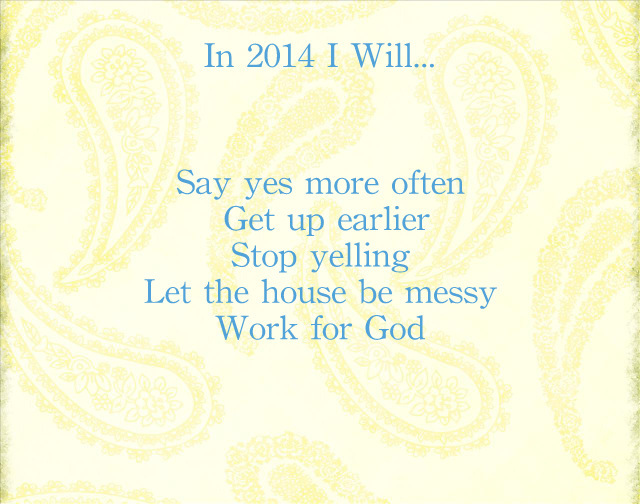 Part of my devotion on She Reads Truth last month included coming up with 5 goals for 2014. Now, I am pretty big on the New Year and fresh starts, and I am honestly pretty good at keeping my New Year’s resolutions. Two years ago I resolved to read the Bible everyday, and I have done that (except for a day missed here and there), and I have resolved to do things like organize and work out, and I have kept up with those pretty well. 5 goals, though? I have been thinking about this for about a week now, and had trouble coming up with 5. That seems like a lot, doesn’t it? Some of these may sound a little strange to you, but they make perfect sense to me. For example, I know most people say “yes” too much and are trying to simplify and say “no,” but I have become really good at saying “no” and probably say it a bit too much. I would like to change that. Get up earlier? Yes. I will admit, I have become a bit lazy when it comes to getting up in the morning, and it really effects my entire day. The others are pretty self-explanatory, I think. I have more I want to add, like get paid for my writing, and be healthier, but I could only choose 5, so……. What are your 5 goals for 2014? And “writing 2014 instead of 2013” does not count! ….so ironic that I just had to go back and change the year on EVERYTHING about this post from 2013 to 2014! Thanks Cindy! Let me know what you come up with! Hahaha one of your goals should have been to write 2014 instead of 2013! Last year, my goal was to lose 100 pounds and I lost 63. This year I’m going to lose 60 more! I’m also going to TRY to start folding and putting away laundry as I get it out of the dryer instead of throwing it on the bed…we’ll see how that goes! My most important, and probably hardest, resolution for this year is to get off of my phone so much! I am constantly on Facebook or candy crush or texting and checking email. I vow to not look at my phone during meals and when visiting people and to pay attention when Johnny and I are watching tv or movies! That’s gonna be hard! Julie, those are GREAT goals! I need to do the phone one, too. 1. Leave my work at work and start taking my PTO. 2. Don’t always be the last parent to pick up at daycare. 3. Stop wasting time being mad at people who don’t matter to me. 5. Use fewer curse words. I’m adding spending more time outside to mine too!! We have great walking trails and parks and I’ve got 2 lazy dogs! Casey, those are great goals. Let me know when you are using your PTO! Thank you! Can’t wait to hear yours!